Paddy Power offer more live horse races on iPhone or Android than any other bookmaker. For a £1 wager watch live video from Curragh, Ballinrobe, Dundalk, Fairyhouse, Killarney, Naas, Thurles and more. 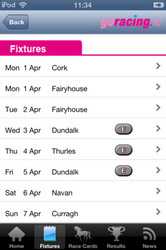 View the complete Irish fixtures list for the year, either by racecourse or month. Available to download for free on iPhone & iPad. No Android version at present. 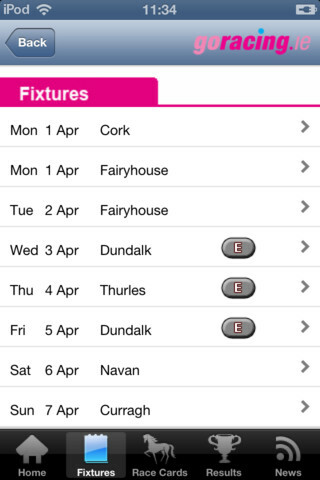 Info on all festivals, including Leopardstown, Fairyhouse, Punchestown & more. Racecards and results for all Irish race meetings plus daily news updates. 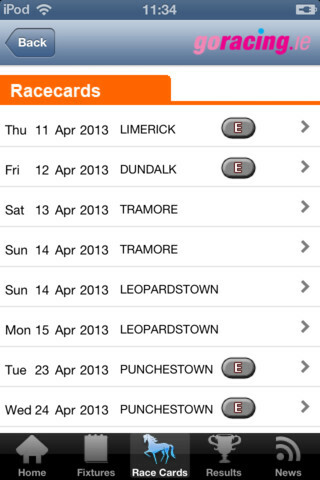 Information on all 26 Irish racecourses to help you plan your day at the races. Racecards feature race start times, form guides, trainer and jockey names etc. GoRacing is a small Irish firm that have set up a site in order to help punters in and around Ireland find out more about local horse racing events. As an addition to their site they have also included a host of stats and information on a number of races in an attempt to lure a larger number of bettors to use their site. 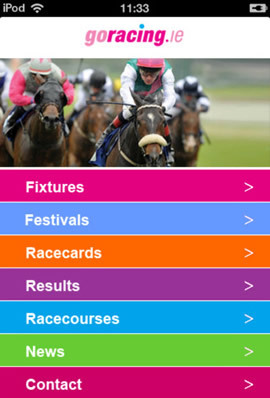 More recently, company have spent a long time developing an app for punters and race enthusiasts on the go. GoRacing won’t have the budget of some of the larger corporations such as the Racing Post and Racing UK, so we don’t expect it to stand up to those kinds of apps. But we are intrigued as to what’s on offer with their website being quite diverse. The home screen is more of a navigation screen than anything else. 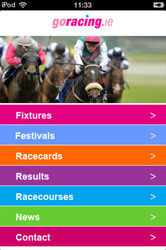 You get 7 options that include fixtures, festivals, race cards, results, racecourses, news and contact information. In terms of aesthetes the app looks a little mashed up with a number of ‘interesting’ colour choices for its navigation menu. In all honesty, it looks a little brash and the colours tend to clash more than compliment. The fixture section is what a lot of the app is based around. You have to remember that this is more of a point of interest app rather than a dedicated horse racing statistics app. You can flick between months of the year or fixtures by track before getting a comprehensive list of all of the meeting in Ireland. Once you have found your meeting you can then see the name and start time of each race before getting an overview of each horse, the trainer, weight and jockey; essentially the Racecard which can also be found from the home page. The festivals section allows you to see information on any upcoming events that are taking place. Once selected, this section will offer you a number contact forms for that racecourse, course information, location, directions and fixtures. As an extension of this you can click the racecourses button from the homepage to get a list of all courses in Ireland and then the same information is shown. What’s nice about these pages is that you can call directly from your smartphone or email the same way. The news section is relatively self-explanatory; it has all the latest news from around Ireland. This is actually linked up to the blog on their website and is updated a number of times every day. 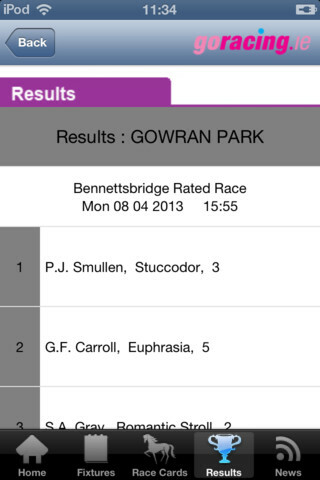 The GoRacing app is definitely something that is targeted towards people who are looking for information from race courses and meetings alike. A horse racing statistical home, it is not unfortunately. In fact, if you lived outside of Ireland you would likely have little use for this app. But for those of you who are keen race goers in Ireland then it will be a handy bit of kit. The inclusion of things such as maps to race courses, contact numbers, lists of races, prize money, calibre of races and also (limited) information on the horses running can all be useful information to have. It certainly doesn’t match the likes of Racing Post and Racing UK, but then again, the more we think about it, the more we think they haven’t intended to!